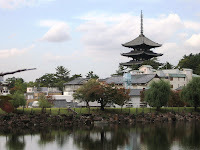 My uncle who lives in Nara sent me this photograph. 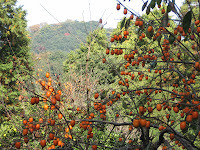 He was surprised you knew about "Fuyu Kaki". 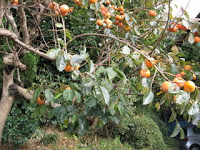 Crows like ripe persimmons. My uncle takes persimmons and crows pick persimmons. They are competing for taking persimmons now. 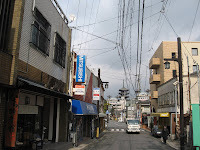 My uncle lives Nara. He sent it me. 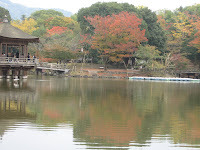 I think the scenery is beautiful Japan. This is fish called SANMA. SANMA is just as nice as the other fish in fall. It is substantially more different of the astringent persimmons . Winter comes again in Japan. Our sons are considering about their Christmas presents. Ukimido and Sagi-ike in Nara. My uncle is worried about our historical cities have a lot of electrical cables. We can't keep the scenery of old cities. We should have made underground utility lines! 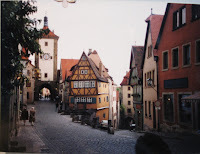 The other hand, Rothenburg in Germany is very beautiful town. I think Germany takes good care of their old towns. You can see five-story pagoda . It is not match. This picture was taken by my uncle, when he went to Rothenburg.